A new report in the BMJ has revealed that people are seriously underestimating the number of calories they are consuming at fast food restaurants. Teenagers are particularly unaware of their calorie intake with most of them assuming that the meals contain more than one third fewer calories than they actually have. Lead researcher, Jason Block, an HMS assistant professor of population medicine at Harvard Pilgrim Health Care Institute, said: “We found that people, especially teens, are consuming more calories than they think they’re getting when they eat fast food.” The study was the first large scale analysis of its kind to evaluate the difference between what adults and teens estimated the calorie content of their fast food meals were versus their real calorie content. 34% of teens underestimated the number of calories in their meals followed by 23% adults who were parents of school-age children and 20% of other adults. In 2011 and 2012, the researchers surveyed close to 3,400 adults, teens, and children at 89 different fast-food outlets in the New England area. Adults, on average, ordered meals with 836 calories and underestimated the calorie count of their meals by around 175 calories. 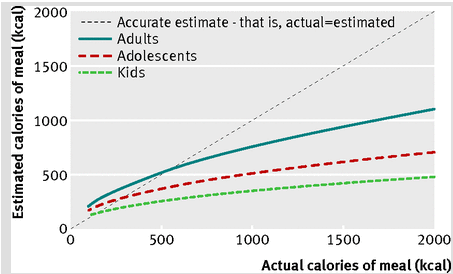 Teens tended to order meals containing around 756 calories and underestimated the calorie count by 259—the largest gap. An overwhelming 25% of the participants thought their meals had 500 fewer calories than they actually had. The authors emphasized that during the time of this study, the fast food chains didn’t post calorie information on their menus. The research was conducted by the Harvard Medical School/Harvard Pilgrim Health Care Institute in conjunction with leaders of the Massachusetts and Connecticut Departments of Public Health. National figures for 2007-2010 show that on average, adults in the U.S. get more than 11% of their daily calories from eating fast food. Fast food chains continue serving meals associated with serious health risks. Their meals may sound and look extremely appealing, but they are actually incredibly fattening and can eventually harm human health if eaten regularly over the long-term. I think people underestimate the calories that they eat, period. In a chain restaurant or otherwise.